Cramped? As cities become denser, we all find ourselves wishing we had more space at times, or wanting to make better use of the space we have. 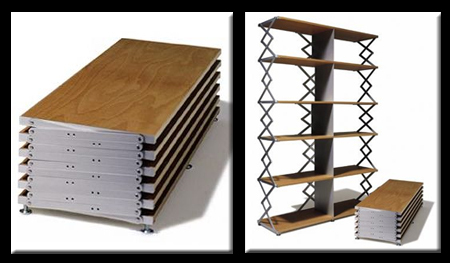 Purchasing changeable furniture that adapts to different uses is one solution to this problem. The above example of the Safe Bedside Table is a more funny than useful. However, the transformable, convertible and collapsible designs below are impressively practical. 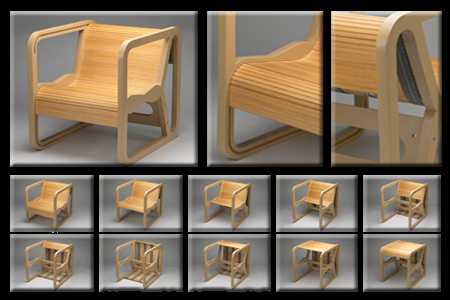 FlexibleLove is an amazing piece of furniture that is ecological, adaptable and highly practical. Made of minimal and sustainable materials, this piece converts from a single-person chair into a flexible bench seating up to sixteen people. Don’t believe it? Watch the video. Tagei is a remarkably beautiful piece of craftsmanship, and somehow manages to be an attractive piece of furniture both when collapsed and extended. One could easily imagine using this as a side table and extending it into a bench for gatherings. Scheren Regal presents an interesting shelving option. This piece would be highly portable for moves and could be used as a side table until more storage is needed, with an elegant but engineered look typical of good German design. Futaba is a brilliantly simple design solution, and converts with amazing ease. The quick-and-easy method of transformation makes this one of the more practical transforming items listed here. ChairLibrary is perhaps a little garish but would certainly work for people whose houses are already overly filled with books. The storage spaces make good overflow storage, at least, as a stop-gap measure before buying more book shelves. Mogga is a remarkably elegant chair that turns into a table. The actually mechanical means by which it transforms is as impressive as the fact that it can so easily convert from one use to another. Ali is a neat and simple piece of furniture that can be configured in a variety of ways. 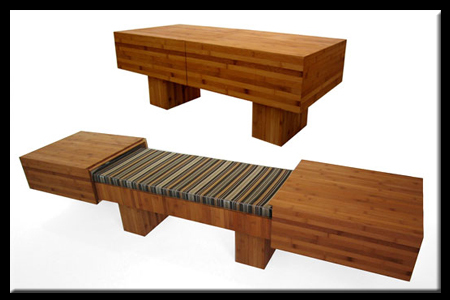 It can be folded and stored, used as a long sofa or pair of love seats or even folded flat into a bed. This seems a much more streamlined solution than many hide-a-beds. Doc is another amazing couch-and-bed solution, but as an added bonus: this one converts into a bunk bed for two. This piece seems like a great solution for people who have visiting friends or farmily who bring children on frequent visits. 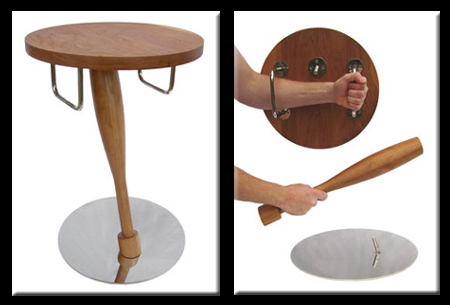 Fletcher Capstan Tables are beautifully designed and as expensive as you might expect. Still, one has to weigh the cost of one’s furniture versus the cost of more real estate. Either way, it is impressive to see these in action. Know of other collapsing, converting or transforming furniture? Feel free to share below!